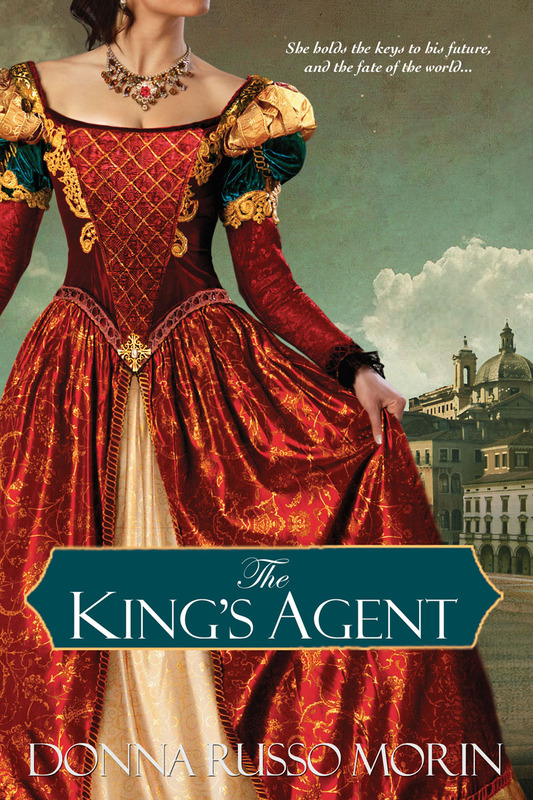 The adventurous characters (both real and imagined) in The King’s Agent travel hither and yon across the middle landscape of that strangely shaped country known as Italy; from Rome, to the mountains of Ciociaria, to Camogli onto the sparkling west coast. 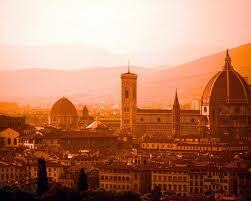 But their story begins and ends and returns now again—for succor and respite—to Florence. So it is to Florence today we go. But first I must tell of my own connection, one I didn’t know existed until after I wrote this book. Yes, in that glorious small speck of time between completing one book and starting another, I sent out a query to an organization that researches surnames. It took them a while to complete the appropriate investigation, during which time I developed the basic idea for my next work in progress, a trilogy also set in Florence on the birth of the female Renaissance artist. It would seem as if my fascination for the ancient city was firmly entrenched in my psyche. 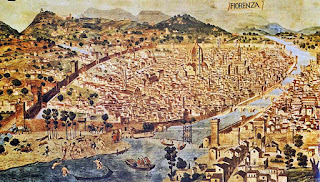 The information, when it came from the research institute, wonderfully illustrated with my family crest on parchment looking paper, declared that the origin of my family was, most probably… Florence. My ancestors have been calling, and I am answering that call as best I can. Its inception can be found, in part, in the politics of the city. A strife-ridden communal system gave way to an oligarchy, a system that would rule the city on and off for hundreds of years. 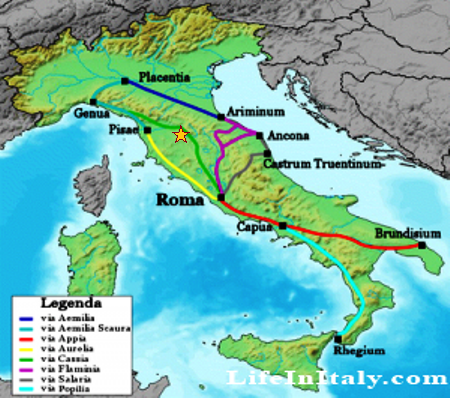 The greatest of all the oligarchies belong to the Medici family (who are not only minor players in The King’s Agent, but who will be taking more center stage in my current works-in-progress). Yes, these were men who had undeniable, dare I say obnoxious, certainty in their superiority, but they were also gifted with open curious minds whose craving for knowledge and truth and beauty brought new and enlightening concepts to within the city walls. Harking back to the teachings of the Greeks and the Romans, they revived the value of the human being and, within this eagerness for knowledge and enlightenment, Humanism was born. Man came to consider himself God’s greatest creation and combined with a craving for rational thought and an affirmation of the natural environment in which he existed. A distinctive characteristic of Humanism was the glory of art, of man’s ability to manipulate media into whatever form they chose. 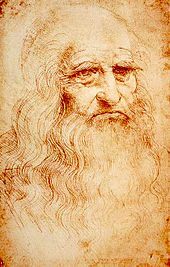 But it was not only painters and sculptors that Florence and its rebirth produced, though there were those a plenty, to name a few: Giotto di Bondone, Masaccio, Domenic Ghirlandaio, Perugino, Michelangelo, Raphael, Botticelli, Titian, and, of course, Leonardo da Vinci. And those are just the upper echelon of painters. Architecture reigned supreme as well under the skillful hands of Brunelleschi, Leone Alberti, Palladio, and Bramante. And their glory was all written about with equal talent by the writers of the age: Petrarch, Boccaccio, Luigi Pulci, and Poliziano. 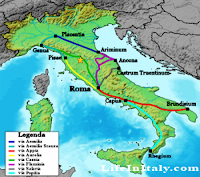 In fact, so many of Italy’s greatest writers and poets were connected to Florence, its dialect came to be known as the official Italian language, beginning with the appearance of Dante’s Il Divina Commedia, a powerful component of the multilayered tale that is The King’s Agent. 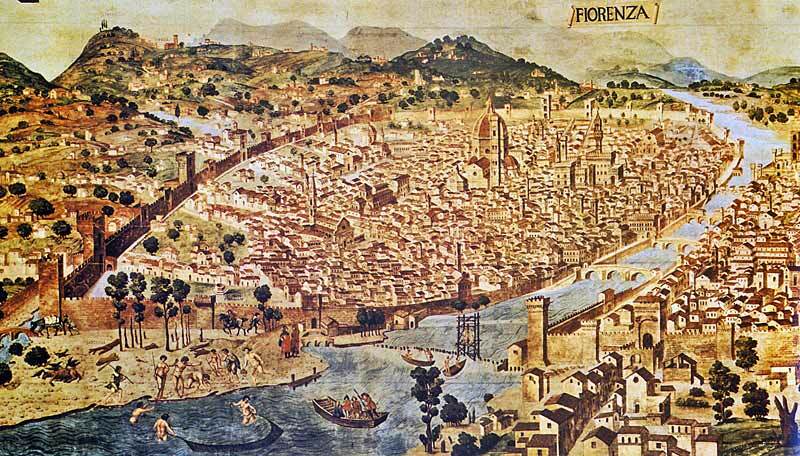 The power of Florence was felt in almost every facet of Renaissance life. The currency of the city, the gold Florin, came to be the most valued, not only in Italian but to all the corners of Europe, from Hungary to Britain to Bruges, and everywhere in between, and helped to develop industry across the continent. The King’s Agent brings us to what is considered the end of the Renaissance, but it will not be the last you hear of it—and of Florence—from the tip of my pen. I would love to receive this book. It sounds like a feast for the reader. Did you enter using the Rafflecopter? Donna writes fantastic guest posts! This one is no exception - very interesting. I was also excited to see that her next trilogy will be on a female Renaissance artist. I'll be anxiously awaiting that! Doesn't she! I love how much time and obvious effort she puts in them to make them interesting. Florence is clearly a place the brings out the happy sighs. I wouldn't know but hopefully one day. Awesome guest post and thanks for the great giveaway! Why thank you very much! So sorry I'm just now seeing this. OH thanks for stopping by. I'll be sure to visit. Florence! It's near the top of my bucket list. What a great giveaway! I would love to go to Florence and I learned so much from this post. I enjoy HF because I learn so much about different places and people. Thanks for sharing and for the chance to win! It's definitely one of the reasons Historical Fiction is one of my favorite genres.